Redactem is an indie puzzle game with gravity and time rewind puzzle mechanics. Reviewing a game like this is new to me. I've written some reviews for major titles, but never an indie game that was made on a limited budget by a very small team of people. While playing Redactem I certainly found its share of flaws and shortcomings, but I also found something else. Something very familiar to my experience with indie devs and something I think most of us can relate to. What I found was a very passionate and attentive focus on the core mechanics of the game. Even to a detriment in other areas of the project. Redactem shines brightest when there's a puzzle to solve and the game's tools fall into place perfectly for solving it. This feels rewarding and encouraging as you progress through the levels. There are switches, keys, moving platforms, missile turrets and pieces of the level that can only be destroyed by missiles. The keys are often required by switches, which themselves can open up the puzzle in any number of ways. The keys can be carried manually, or dropped directly into the switch that requires them. Players have the ability to reverse gravity or rewind time whenever they want. All of these elements and abilities are brilliantly strung together to form interesting and compelling puzzles. 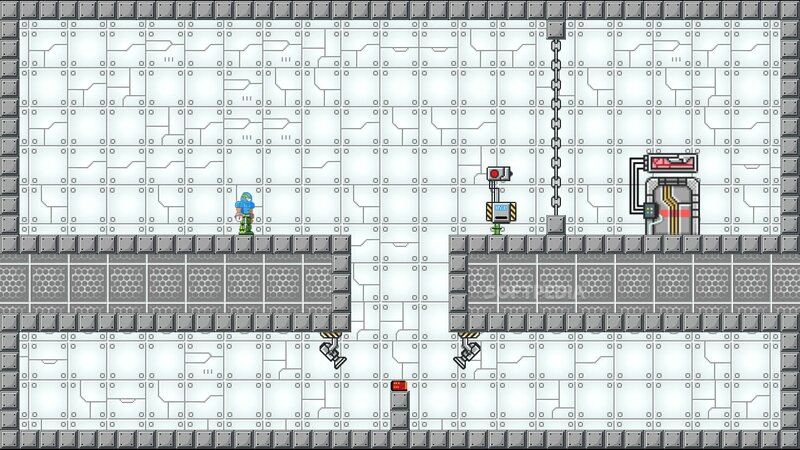 Some puzzles may require you to get a key to open a lock without ever touching it, only using your abilities, moving platforms and even the aforementioned missiles to carry a key to its destination. To me, these kinds of puzzles felt the most inventive and original. In addition to puzzles that require specific logic to solve, there are also instances where precise platforming, wall jumping and avoiding hazards is required to solve the puzzles. 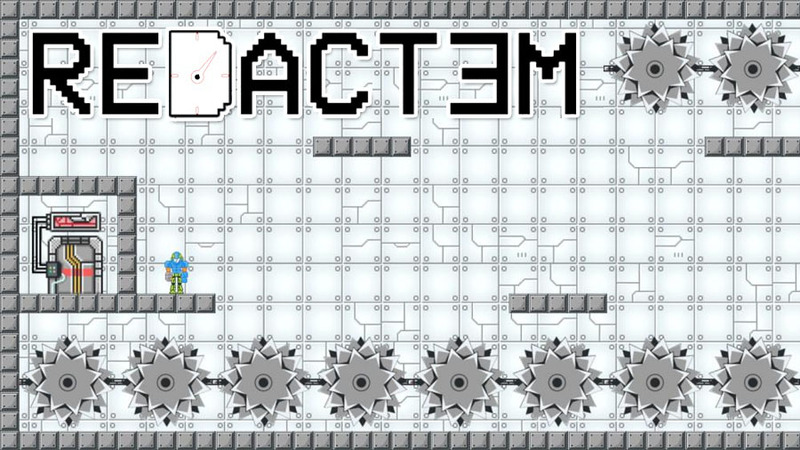 It feels inspired by games like Super Meat Boy, but Redactem doesn't have quite the same control fidelity as SMB. There's a button to run faster, and a similar wall jump and slide, but the overall feel of controlling the game falls closer to Commander Keen than modern fast paced platformers. Puzzles that heavily rely on the platforming elements felt more frustrating than their purely logical counterparts. These puzzles often had me finding the solution pretty quickly, but spending dozens of tries actually getting the solution to work. For me, these parts felt less compelling after the initial "aha" moment. I think Portal really set the standard for puzzle games in this sense by rarely (if ever) requiring the player to do any acrobatics. I died a whole lot on these parts of Redactem, luckily you can restart the level instantly. The levels in Redactem can't be skipped, which means that if you get stuck on one, you're not going to see any new levels until you beat it. This may be pretty standard, but it creates some hard walls that players will undoubtedly hit while playing the game. Some of you are probably reading this and saying "well, GIT GUD!". That's a fair assessment, and while I'm decent at platformers, I'm certainly not the best. The problem with "git gud" in this instance is that the focus of the game is clearly the puzzles. The platforming doesn't do anything especially new or compelling, giving little incentive to improve at it. If you're like me and love 8-bit chip tunes and classic NES era soundtracks, this is going to be right up your alley. The music here is phenomenal. Once I cranked up the audio on this title, my enjoyment of it increased considerably. The music in Redactem has that true NES classic sound to it, while also being very original. It kicks off at the start of each puzzle and doesn't start over for player deaths. This gives each level a feeling of continuity as your character dies over and over. The decision to not restart the music on each death was a very solid one. Unfortunately the rest of the audio is fairly bare bones. There's audio samples for jumping, and using your powers, but they're not perfectly mastered or balanced with one another. Elements like that will remind you that this is a low budget production. My first impression of this game was not a good one. The look of the game fails to stand out. Everything feels fairly bland at first and doesn't really come into its own until after the eight mandatory tutorial puzzles. I fear that this alone will cause many players to disregard this game before getting to see the really great parts of it. Because of this, I decided to reach out to the developer, Elliott Marc Jones, to ask why the game looked the way it did. Predictably, a lot of it had to do with budget constraints and a laser like focus on what he was passionate about - the puzzles. He told me that there were certain requirements to making the puzzles work that didn't allow the artist full creative freedom. It seems that they tried a few different styles, but a lot of it ended up on the cutting room floor in favor of a style that suited the puzzles. Unfortunately, as is the case with many indie games, marketing a dev passion project like this can be a nightmare. Redactem leans heavily on its strengths as a puzzle game, but marketing puzzles is not easy to do. Redactem's lack of flashy stylistic graphics or a unique look really hurt its up front marketability. It's difficult to get people excited without showing them what the game looks and plays like. Unfortunately showing what Redactem looks and plays like simply isn't enough when the game's strength is those "aha" moments which can only be experienced firsthand. While I can't say I would recommend Redactem among the sea of games coming out this year, I can certainly say I enjoyed myself while playing it. This game suffers from lack of funding and time constraints. It does not suffer from lack of creativity or skill on the part of the developer. Redactem reminds me of very early versions of Braid, before it got its signature art style. I expect most people would have passed that title up as well, if it didn't hook people in with its unique look. Check out Braid's visual evolution below. I'm confident that Elliott Marc Jones will go on to do some amazing things in this industry as his projects increase in scope and manpower. Often the hardest part of making a game is just seeing the project through to the end, and Elliott has already proven he is able to do that. Redactem has passed Steam Greenlight and can be purchased on Steam, Gumroad, IndieGameStand, GamersGate and Green Man Gaming.